Facebook | Color Ink, Inc. The wizard behind the curtain? Social media. The success stories are abundant – go ahead, google it. Time and time again, social media has aided organizations and taken their achieved success to a higher level. But just how exactly can tweeting, posting, and pinning increase your company’s revenue stream? The concept is simple: enhance your brand, establish reliability, and your following will grow. It’s been said, “If you build it, they will come.” In reality, that rule is actually more applicable in today’s business world than for fictitious baseball diamonds (see the Miami Marlins). With social media, the marketing possibilities are literally endless. Take Color Ink’s very own FunDeco furniture & decor for example. From humble beginnings, FunDeco has transformed into a well recognized, popular brand now seen in campus bookstores, Marquette basketball games at the BMO Harris Bradley Center, tailgates throughout the United States, and even heard on ESPN Radio – all within a six month span. 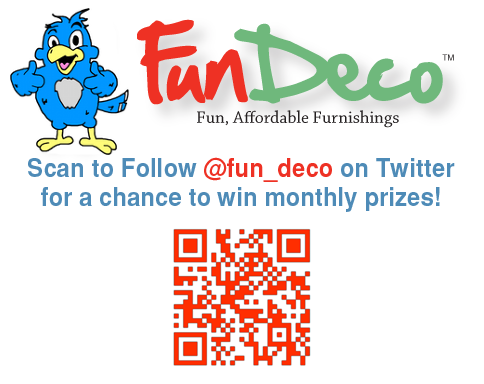 Over that time, FunDeco has seen its “likes” on Facebook rise from twenty-something to a whopping 2,490 and counting. Each “like” represents a unique fan who now receives FunDeco updates, promotions, deals, and games right in their Facebook news feed. As a result, FunDeco has enjoyed a dramatic spike in sales. Interacting with individual customers via social media platforms is one of the best ways to get a leg up on the competition. If you’re unsure about starting or improving your own social media efforts, we’re here to help! Please do not hesitate to contact us. We’re more than happy to discuss what our social media team can do for you! If you’re here, chances are you’ve seen us elsewhere on the web. But have you seen us on your favorite social media site yet? We’re probably there. Explore our other pages… we bet you’ll like what you see!